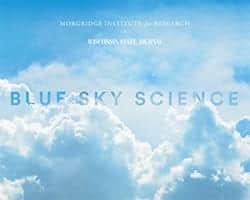 News & Stories > Blue Sky Science > How do bees make honey? They go into the center of flowers and collect nectar, a sugary water. Plants produce nectar to attract pollinators like bees, and this nectar is the main food source for bees. The honey bees will collect a lot of nectar from flowers and put it in a special pouch called a honey pouch. When the pouch is full, it tells the bee that it’s time to go back to the hive. When they return to the hive, they regurgitate or spit back out the nectar into cells—honeycombs— in the hive made especially for honey production. When the nectar’s in a bee’s mouth, it’s mixed with an enzyme called invertase that helps break down part of the sugar. It can take a bee many nectar-gathering trips to fill up a cell. Once a cell is full, a group of bees will fan it to help evaporate out the water and make the mixture more concentrated. Honey is about 75 percent thicker than nectar, so lots of water needs to be removed. When the bees are happy with it and it’s concentrated enough, they will cap the cell in which the honey is produced. The type of flower visited impacts the kind of honey produced. Scientists are finding that in one foraging trip a bee will mostly stay with the same flower. Commercial producers of honey will often make sure the bees visit certain plants in order to get a certain type of honey. Currently honey bees are in decline due to colony collapse disorder and factors like climate change, and scientists are working to understand all the causes. Losing bees affects not only honey production but agriculture and food production. Most of the vegetables, fruits and oil or hay producing crops like canola and alfalfa require insects like bees for seed production.